Update: Latest Xposed framework 88 now available for download. Official Xposed for Nougat to come. Xposed with Magisk. Earlier, the developer of Xposed developers announced the progress of the most awaited Xposed framework for the latest Android Nougat OS. The developers have successfully been able to compile and develop Xposed Framework support for the Android devices running the latest 7.1.2 Nougat. This includes all the stock based firmware like Oxygen OS, TouchWiz, Samsung Experience 8.1, Sony Xperia, HTC sense, Xiaomi’s MIUI, and much more. This comes with the latest builds of Xposed Framework v88 also brings support for our beloved custom ROMs like Lineage OS 14.1, Resurrection Remix 5.8.3, Paranoid Android 7.2.0, etc. This is a great deal for the Android community. 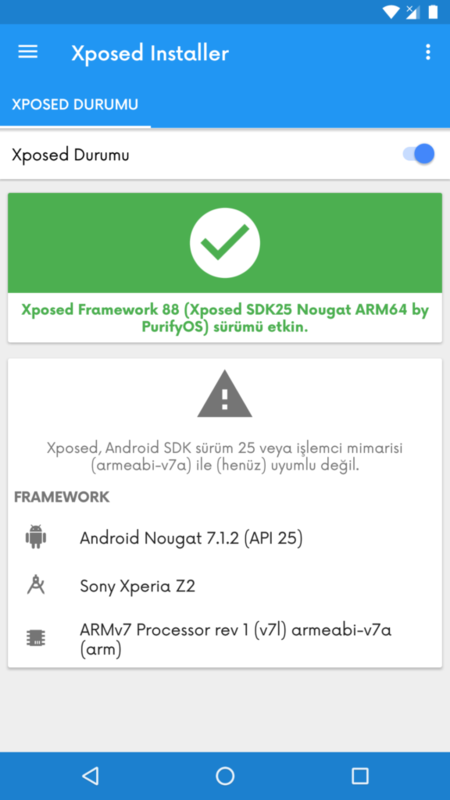 The PurifyOS team have slightly modified the Xposed Nougat sources posted on Github by ABForce and XposedTool of the Rovo collector. This enabled them to bring unofficial support to all the Nougat running firmware and Android devices. ART module for a built-in enabled Xposed firmware based on AOSP 7 has also been posted. Xposed sources have been compiled to work with SDK 25 package from AOSP Nougat. Moreover, you will find support for 3 architectures, viz, ARM64, ARM, x86. See: How to confirm your Android device’s architecture – arm, arm64 or x86 click here. 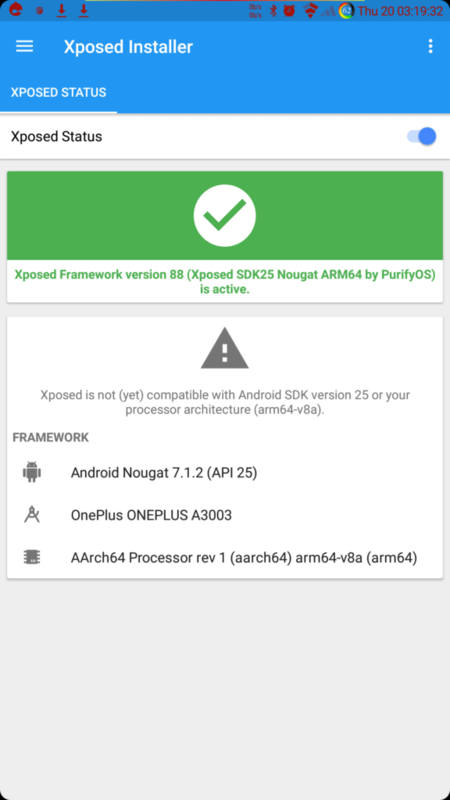 Xposed have been tested working with the Oneplus device, Sony Xperia series, etc on various stock and custom ROMS. You will need to test it on your device yourself. There are basically 2 builds for Xposed listed below. Both work perfectly fine. We will also post the official Xposed for Nougat once it’s out. There are basically two builds available for Xposed. One from PurifyOS ErnyTech and another from BlackSoulxxx. We now have Xposed for magisk. The Xposed installer app will provide you with a visual interface to operate Xposed Framework and use various modules. First, you will need to flash the following Xposed zips in order to fully use the application. Xposed Magisk Systemless need Magisk 13.1 or newer. It is recommended reinstalling Magisk before installing the Xposed module. Download Xposed Modules for Magisk here. Mirror repository for Xposed Magisk. This is the unofficial Xposed v87 developed for SDK 25 with latest AOSP Nougat sources. It comes in support for ARM, ARM64, x86, and Magisk as well. The best thing is if you already have Magisk installed, the flash the Xposed for Magisk. Warning: Once you root, install a custom recovery or install Xposed Framework, your warranty may be void. This may get your device into boot loop or a soft brick, hence, you should be cautious about the procedure and make a wise decision. Reader’s discretion is advised. How to install latest Xposed Framework on Nougat with Xposed v88+? The installation is very similar to that of the Xposed v87 developed for Marshmallow. All you need is the proper file and that’s it. 1. Unlocked Bootloader is a must. This is usually required to setup TWRP on Android devices. If you already have TWRP recovery installed, then you can flash the Xposed Framework right away. See some of our tutorial for reference on OnePlus Oxygen OS, LG, Huawei etc. 2. Make your Android device is rooted. Get to know how to root your device via SupaerSU. Alternatively, you can choose Magisk root method. 3. Make sure you have latest custom TWRP recovery installed. See how to install TWRP on Android. 5. Go to developer option and enable Advanced Reboot. Step 1: Download the latest Xposed Framework zip file, Xposed Installer APK, and Xposed Uninstaller for your device from above. Step 2: Transfer all the necessary files to your device’s internal storage or SDcard. Place the files where you can easily locate them. Step 3: Reboot Android into TWRP recovery. If you have Advanced Reboot turned on, then hold the Power button and choose Reboot to Recovery option. Step 5: Go to the home screen again and tap Install option. 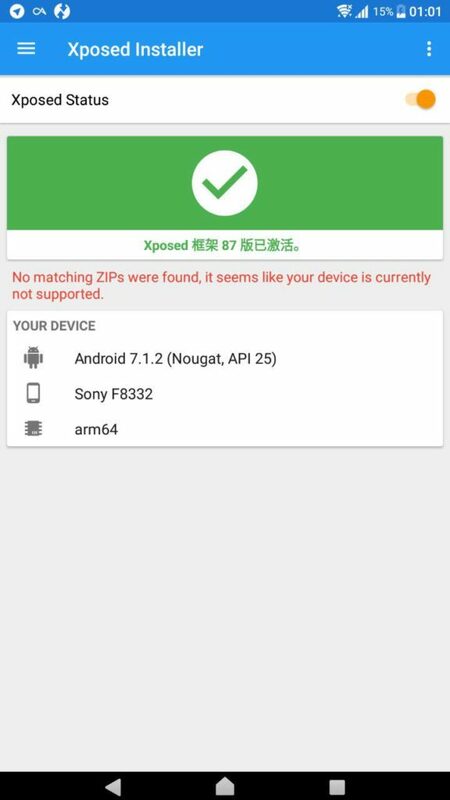 Navigate to the Xposed Framework zip (xposed-v88-sdk25-arm64.zip) file in your device storage. Select it and swipe right on the confirmation action button below to begin the installation. If the system doesn’t boot after Xposed Framework, then wipe Dalvik Cache. You can always flash the Xposed Uninstaller. As a last resort, restore the TWRP backup that you just took. Like and share us on social media. If you need any help, then comment down or visit forums. No luck for me on my Nexus 6p running Resurrection Remix. Was able to install, but force closes galore.